Halloween was never big in Australia. Growing up, my parents didn’t even acknowledge it! Since starting the blog I’ve tried to overcome this ingrained notion of Halloween not being Australian, because, let’s face it, I’ll take any opportunity to bake. But before I share some recipes that I consider traditional Halloween fare, I need to have a whinge: SO MANY of the recipes that I find on Pinterest, FoodGawker, etc, need tinned pumpkin or similar. Is anyone else searching for tinned pumpkin in Australia with no luck? I have never seen this in Australian shops, and the idea of it kind of creeps me out. I felt the same way when I lived in England –cocktail frankfurts in a tin? Corned beef in a tin? Blech. Some things just aren’t meant to be canned! Tinned food-phobia aside, I’ve got a solution for you, this is a good alternative if you want to recreate pumpkin based recipes. It takes a little extra time, but it’s worth – it’s simple, can be stored in the freezer, and makes your baked goods super moist. It’s not quite a recipe, as it only has one ingredient, it’s more of a foundational, kitchen-basics type thing. Preheat oven to 180° and line a baking tray with baking paper. De-seed pumpkin. 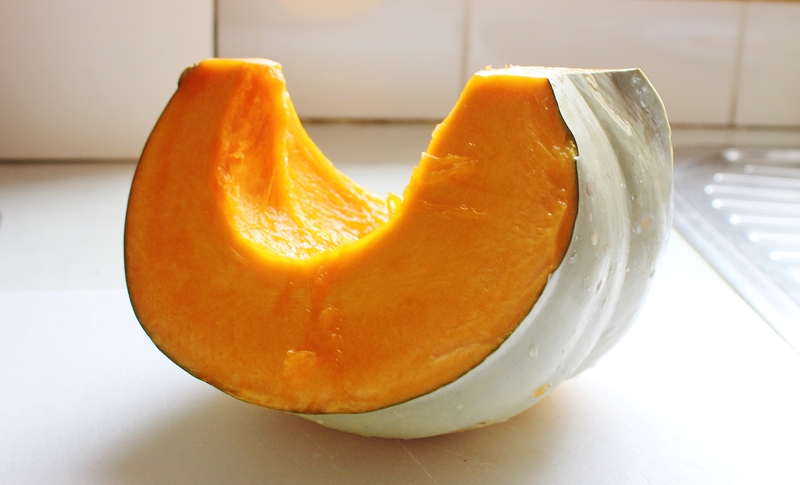 Slice pumpkin up into at least 8 chunks – leave the skin on, it’ll be easier to remove once it’s cooked. 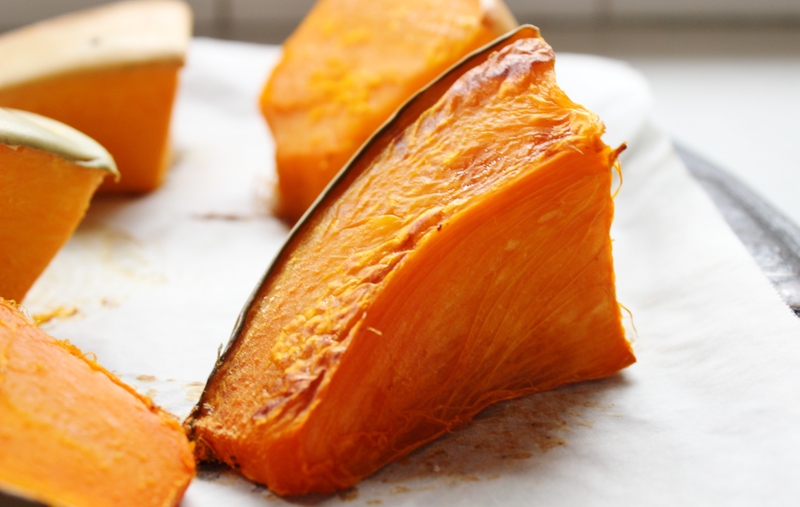 Don’t bother adding oil, you want this to be as close to 100% pumpkin as possible. Pop pumpkin on the tray and into the oven for 50-60 minutes. You’ll know it’s ready when the skin has started to shrivel slightly and you can easily stick a knife through the pumpkin flesh. Slice off the pumpkin skin and discard. Pop into a blender, or mash manually like I did. 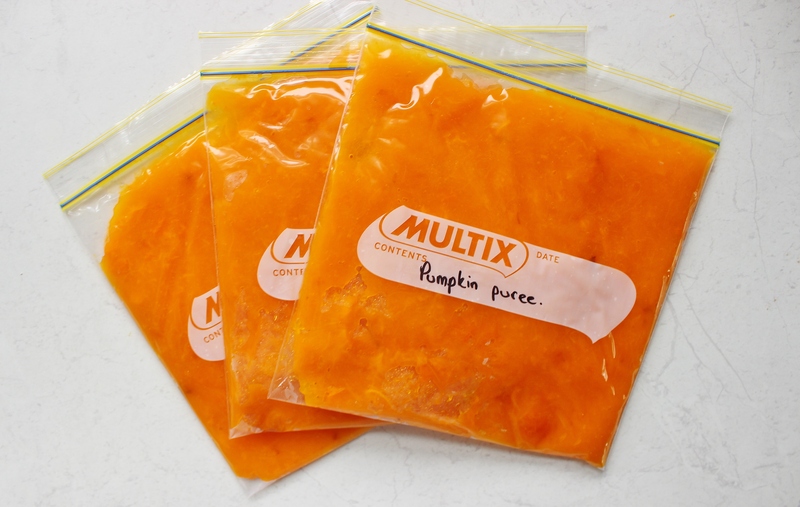 Measure out one cup at a time and put them into snap lock bags, ready for the freezer.